Water, beans, rice, kale, clams. Try that for every meal, every day. For someone who really loves to cook and eat and have a very wide variety of flavors, this is the challenge. There are plenty of greens in the garden but it's easy to get sick of them quickly. Especially when they are not too flavorful on their own. And even more so when you don't have any seasonings or fats to cook them with. I ate the last of my clams for dinner. I fired up the grill and put the clams right on the grate along with some large leaves of collards. 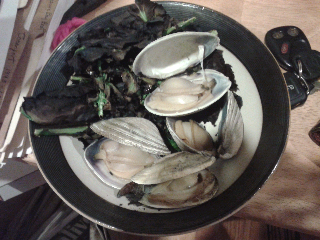 When the clams opened they were done cooking and the greens crisped up like chips. It was a new way to do the greens and although it was different, it still did not make them taste all that much better. Maybe with some bacon! Hey - this is interesting. . .(to me). I was reading over one of my posts from last year and it clearly says to START ON A WEEKEND! Check it out here if you don't believe me. Geez. I think I'll read some more past posts so that I can start LEARNING FROM MY MISTAKES. I feel like a big dummy. Tomorrow is Saturday and it's supposed to be a drippy weekend. I'm going to have to try some early morning fishing in order to get a substantial meal to carry me through the weekend. Wish me luck. 3 days in and I've dropped about 5 pounds already.